From this section of the Apparel Magazine website, you can learn about the fashion magazine Vanity Fair. Do you know who reads Vanity Fair? Smart, stylish, and voraciously interested in the world, Vanity Fair readers have an extraordinary ability to discern what is truly worth their time, attention, and money. It is essential for Vanity Fair readers to be conversant in a wide range of topics—from global issues, economics, and travel, to beauty, fashion, and entertainment—and they pursue the knowledge of these subjects with an unusual intensity. Vanity Fair readers actively seek out friends and colleagues with whom they share ideas and experiences, creating a diverse and eclectic network of peers. Known for its ability to "ignite a dinner party at 50 yards," Vanity Fair is meant for readers who enjoy expert-level knowledge and lively, spirited debate. With every issue, Vanity Fair allows its contributors the freedom to indulge in extraordinary storytelling, making it a destination for the world’s most renowned photographers and award-winning journalists. 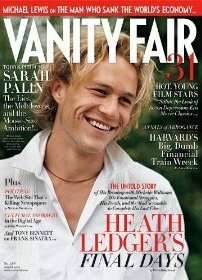 Find Vanity Fair Magazine on Amazon. Visit the Vanity Fair website. We hope you enjoy Vanity Fair.